At this time of year, the sudden fall in temperatures and creeping approach of dark winter nights always gets me looking forward to Christmas and the new year. Like with most gardening jobs, it’s usually best to plan ahead, and getting ready for the holiday season is no different. 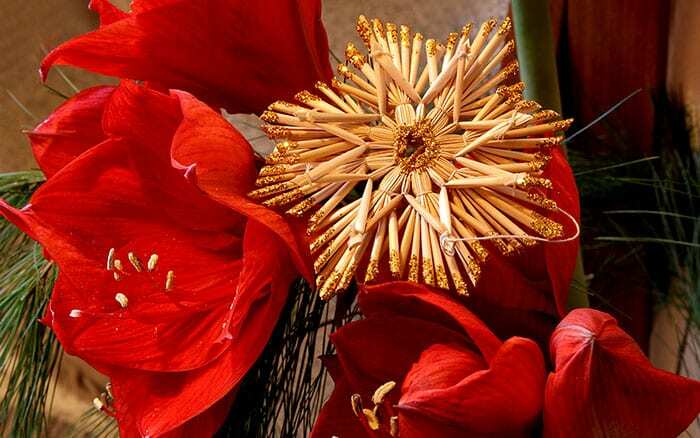 Get planting now and you’ll have a house full of dazzling other-worldly blooms to keep you company throughout the Christmas period and beyond. Here’s how…! 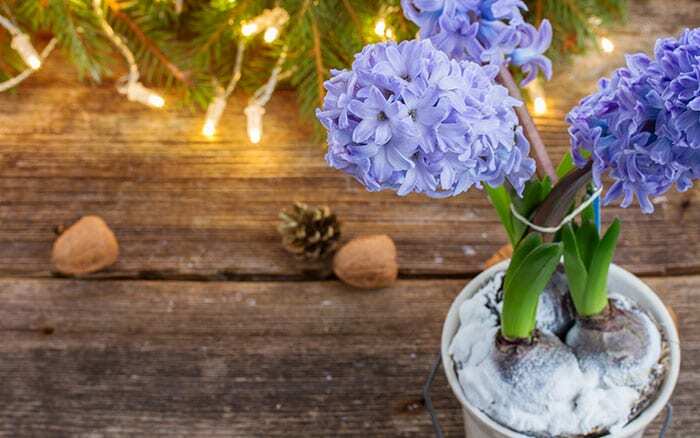 If you’re looking for a way to ensure beautiful indoor flowers just in time for Christmas, you might consider buying some bulbs for forcing. While this may sound a little technical (and unpleasant! ), forcing bulbs is a simple process in which environmental temperatures are controlled to make bulbs think that spring has sprung when, in fact, we are still in the bleak mid-winter. This causes the bulbs to bloom early and give us jolly celebratory flowers out of their natural season. One of the best choices for the novice forcer is Hippeastrum (Amaryllis). These large, exotic-looking bulbs are exceptionally easy to force and their spectacular showy blooms come in a range of fabulously festive colours. In my opinion you can’t go wrong with the Holly-berry-red of the ‘Red Lion’ variety or the festive Santa’s-suit-crimson of the ‘Belinda’ cultivar—these never fail to get me right into the Christmas spirit. Forcing Hippeastrum is best done towards the end of September if you want to be sure of flowers in time for Christmas Day. 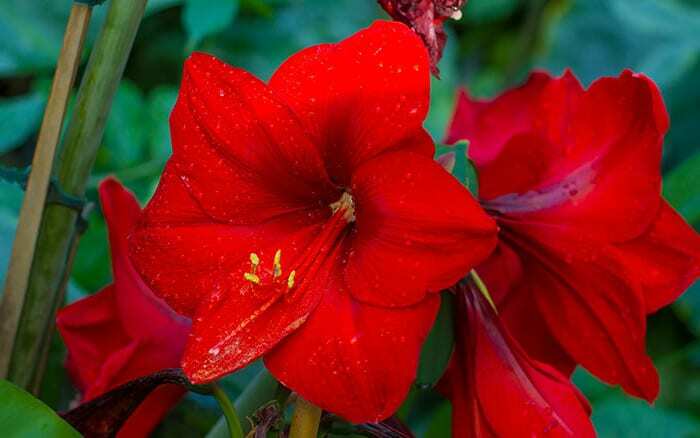 To begin the forcing process, soak your Hippeastrum bulbs in water for a few hours before planting. This will help to re-hydrate them more quickly, thereby kick-starting the growing process. Next, choose a pot that will just contain the roots of your bulb, that is only slightly larger than the bulb itself—this is because Hippeastrum, unlike most other plants, positively enjoy being pot-bound. Once you’ve chosen an appropriate pot, place a layer of horticultural grit in the bottom for drainage, part-fill it with compost, firm down and sit the bulb on top. 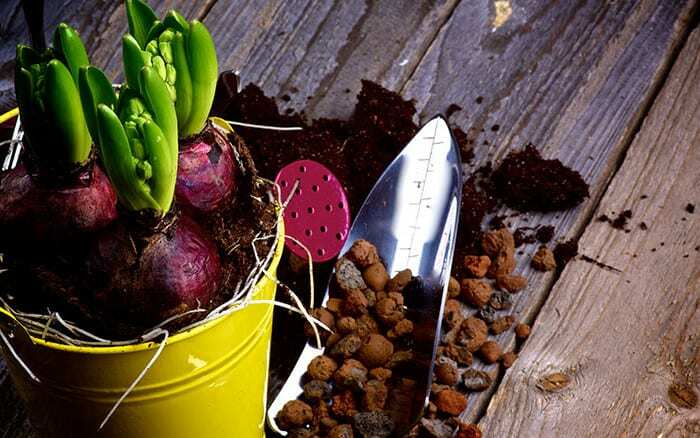 Cover the roots with as much compost as you can cram in and firm down, leaving the top third of the bulb uncovered. This will keep the bulb in its preferred elevated position and help to create the feeling of being confined that Hippeastrum really enjoy. Finish by watering thoroughly. To communicate to the bulb that spring is here early, begin by placing it in a warm dark place but leave it un-watered until a shoot emerges (usually about two weeks). At this point, bring the bulb into a warm, bright room and keep the compost regularly moist, mimicking the conditions of natural spring. Be careful, however, not to waterlog the soil as this could cause the bulb to rot and keep them out of direct sunlight. The artificial warmth of your indoor environment should have the bulb producing flowers within six to eight weeks—just as the kids are starting to open their advent calendars! The flowers usually last for four to six weeks and will be extended if you keep them in a cooler, but no less bright room. Hippeastrum are a little pricey—costing upwards of £10 per bulb at the time of writing—but their tremendous winter blooms are worth every penny in my opinion! Another option is to plant varieties of Narccisus, aka Daffodils, for forcing in time for Christmas. I don’t know about you, but the jolly heads of Daffs popping up in spring always gives me a great sense of hope as I look forward to the coming year—so why not give yourself a chance to feel hopeful a little early this year? All varieties of ‘Paper White’ Daffodils are suitable for forcing and most have a delightfully strong scent, which is fantastic indoors. 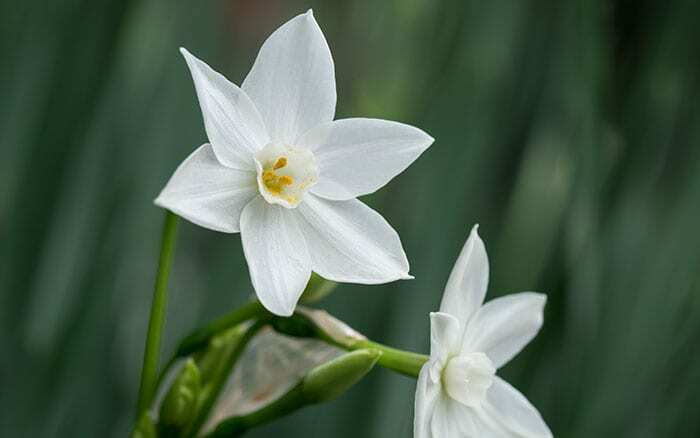 Look for the ‘Avalanche’ cultivar for a Three Kings golden centre that contrasts with a ring of shepherd’s sheep white petals or go for the pure snowy white of the ‘Ziva’ variety with its Christmas bell centres. The method for forcing these bulbs is like that for Hippeastrum and similarly nice and easy. Start by buying bulbs that are specifically labelled as ‘prepared’ for forcing. These bulbs have already been chilled for several weeks, meaning that some of the hard work of creating an artificial winter has been done for you. If you’re not sure what you’re looking for, ask for help at your local garden centre. They’ll be able to point you in the right direction as well as provide advice on timing for forcing particular cultivars. Narcissus always look their best when planted in clumps, so choose your pot accordingly. Again, pop a layer of grit in the base of the pot for drainage and part-fill with compost. Place the bulbs in the pot, close together but not touching, and cover with compost until their tips are just below the soil’s surface. Water thoroughly and pop them in a cool, dark place for three to four weeks and keep regularly moist until their shoots are about 5cms tall. This fools the bulb into thinking its experiencing cool winter weather. 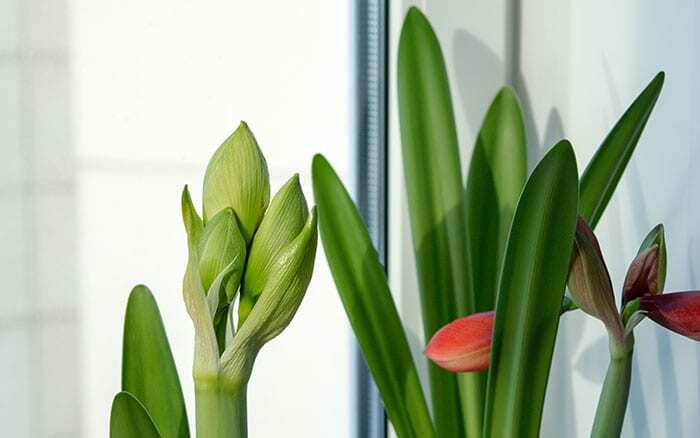 Finally, bring the bulbs inside and place them in a warm, sunny place—a bright window sill, while disliked by some houseplants, is absolutely perfect for forcing Daffodils. They will flower around six weeks later. This means that the ideal time for planting ‘Paper Whites’ to give a gorgeous Christmas display is mid-October. If you’re looking for something a little more challenging, consider Hyacinths, which require a little more finesse but are still reliable Christmas bloomers if you follow some simple rules. As with Narcissus, buy bulbs that have already been ‘prepared’ for forcing. I always think that Hyacinths look their best when several are bunched together into a single pot, so I’d suggest choosing a pot that’s wide enough to contain at least three or four bulbs, with a space of 7-10cms (3-4 inches) in between. Spacing bulbs at this distance will give them a chance to swell without disturbing one another. Again, place a layer of grit in the bottom and part-fill your chosen pot with compost but, in this case, do not firm down—this will enable new and delicate bulb roots to push through the growing medium without difficulty. 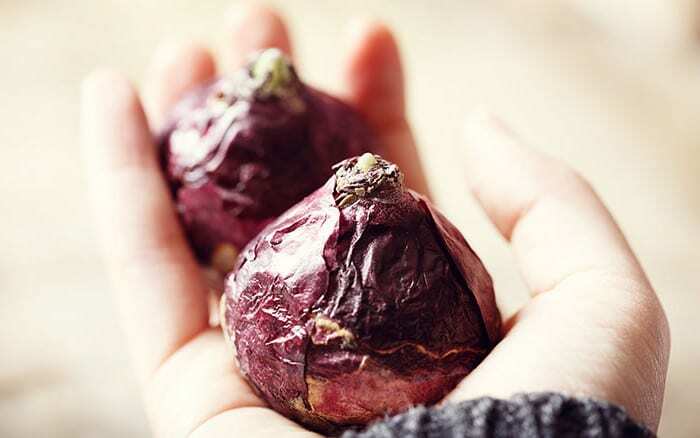 Next, place the bulbs into the pot and fill around them, leaving just their tips exposed and firm down (do this whilst wearing gloves as Hyacinth bulbs can irritate your skin). Water until the soil in the pot is moist but be careful not to over-water—leaving water in the bottom, especially in a pot with no drainage holes, could cause the bulbs to rot. Now comes the forcing—wrap the container in black polythene and put the bulbs in a cool dark place, such as a cellar or garage, to chill. Ideally, the temperature needs to get down to around 9˚C to make the bulbs think that winter has come early. 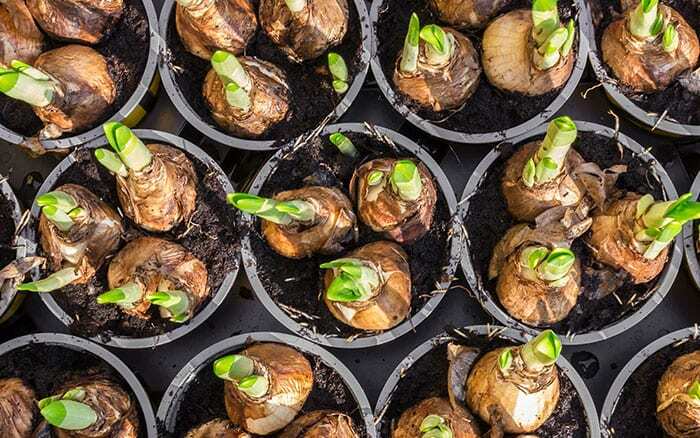 Unlike Hippeastrum bulbs, you will need to keep Hyacinths moist while you’re waiting for shoots to appear. Water just enough to make sure the compost does not dry out. 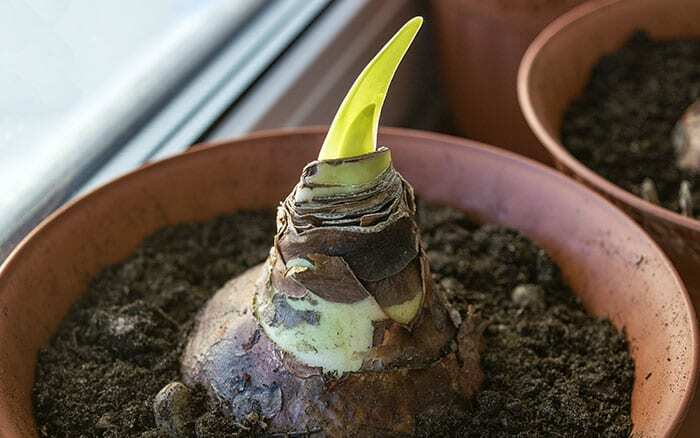 These prolonged cool, moist conditions will create an artificial winter and give the bulbs time to develop a strong root system before light pulls the flowers from the bulb—if this happens too early, the flowers will be disappointing, so don’t rush it. Once shoots are about 5cm high, it’s time to convince them that spring is here! Bring them inside, place them in a warm (15˚C+), well-lit room and watch as your Hyacinths burst into beautiful bloom. This usually takes around three weeks. 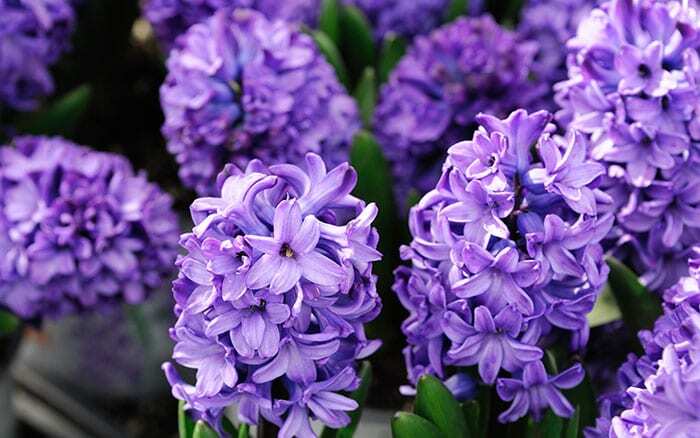 The chilling period for Hyacinth bulbs varies according to the cultivar. For example, the ‘Pink Pearl’ variety requires around ten weeks of chilling but only three weeks of artificial spring before flowering. 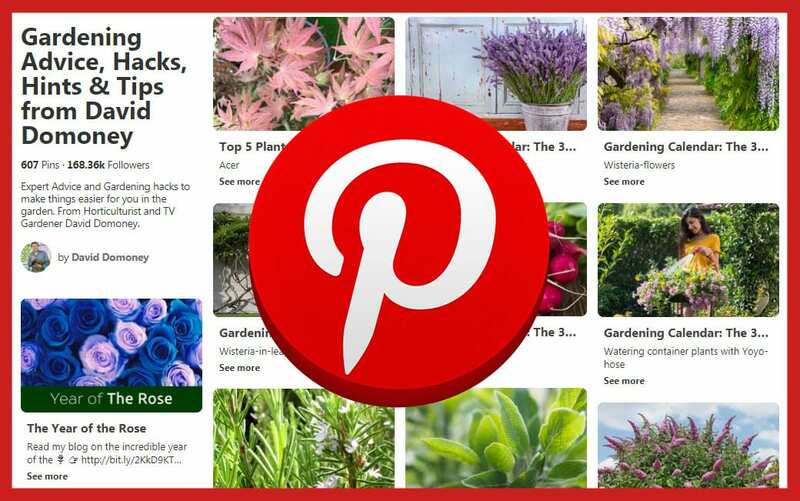 This makes them ideal for planting in the last week of September for Christmas blooms. The ‘Anna Marie’ cultivar, on the other hand, is faster. This variety requires a mere eight weeks of chilling in the pot and will bloom after just two and a half weeks of pretend spring. These, then, can be planted as late as mid-October and still flower in time for Christmas. 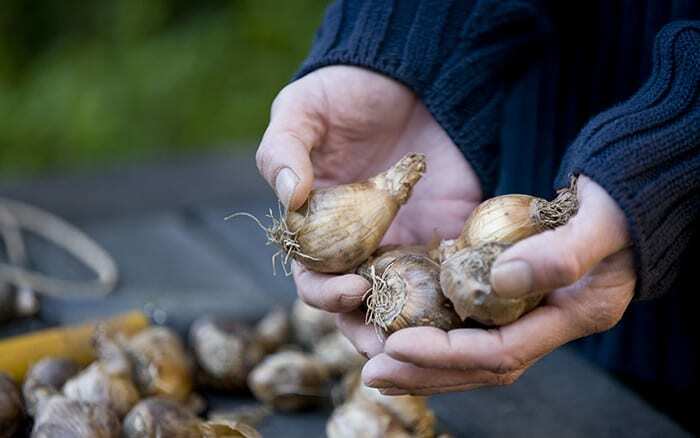 As such, if you get started in September, you can actually prepare ‘Anna Marie’ bulbs for forcing yourself by popping them in a paper bag in your fridge for four to six weeks before planting. So be sure to look up the exact cultivar you’ve bought to get the timings just right. Something I love doing, personally, is planting several rounds of Hyacinths a few weeks apart so that they flower in succession throughout the festive season and beyond. There’s nothing quite like a house full of incredible flowers to get you through the post-Christmas hump! 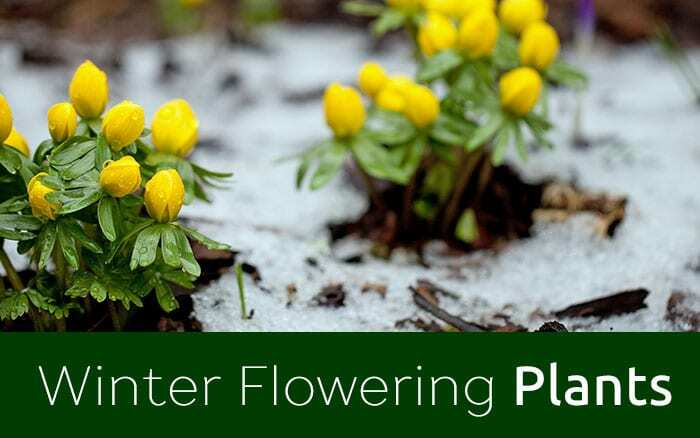 Of course, if you go to town and plant successions of all three of these recommended plants, it won’t just be the bulbs that feel like spring has sprung early this year. You could even save yourself some money and put a smile on the faces of friends and family members by planting extra bulbs now and giving them as gifts in December. There’s simply nothing quite like marrying the joy-to-the-world of Christmas with the many joys of spring!